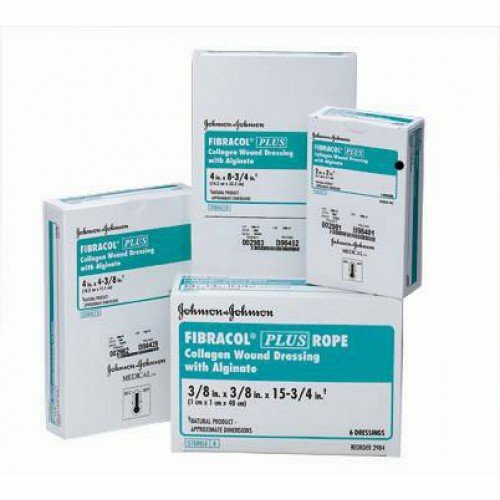 Fibracol Plus Collagen Wound Dressing with Alginate by Johnson and Johnson is a soft, conformable wound dressing composed of 90% collagen and 10% calcium alginate. It is favored by clinicians for use with debridement, absorption, odor, wound irritation, and for its ease of use. This collagen wound dressing has added versatility, with a unique combination of collagen and alginate that is able to address a wide range of wound types and different exudate levels. This combination also creates a moist wound environment conducive to granulation tissue formation, which enables a rapid rate of healing. It also ehances the hemostatic properties of the dressing. The wound dressing is twice as absorbent as traditional Fibrocal Collagen-Alginate Dressing. It is nonadherent and so removes easily, leaving the wound free of fiber. The soft and conformable sheet of collagen wound dressing can be cut to fit any size wound. It also maintains its initial integrity when wet. 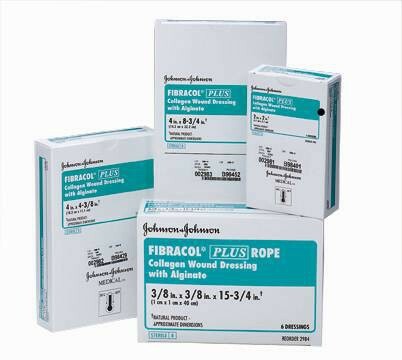 Fibracol Plus Collagen Wound Dressing with Alginate by Johnson and Johnson is also availabe in rope, which can be packed in deep wounds. It is packaged for convenience in either singles or boxes. How many are in the 4x4.4 package for 11.84?? The quantity refers to the number of items you will receive. For instance, "each" will give you one, "Box of 12" will give you 12 individual pieces, and so on. You will receive one item for the price listed. Is the Product still effective after the expiration Date ? if kept cool and dry and still sealed in it's Air tight Packaging ? And if so, How long before it's totally none effective ? Hello Mr. Kuehn, Jr.: This is not an item we carry in our warehouse and therefore cannot accurately answer that question. It's best to contact the manufacturer for a clearer answer. This was recommended by my surgeon for post op care. It can be hard to find but this site has a great selection and it arrives in a day or two. It doesn't get any easier than that. I use this product for wound healing for my son. Vitality Medical offered the best price and was recd early. I recommend Fibracol Plus to anyone who needs a wound dressing that requires cut-to-size pieces. His wound is now small but I can cut to the size required. Fibracol does what it says it does. The dressing will dissolve over the wound, keeping it moist. Best product I have found for treatment of ankle ulcers. For maximum absorbency, use this. This is by far the most effective dressing I've ever used. I have patients who has bed sores for most of their lives here in the facility. I frequently have to change dressing just to make sure that the sores heal fast, but even that effort did nothing. So we changed to this dressing and it proved to be superior. I noticed changes in the sore conditions a day after we replaced the old standard dressing with this one. And now, 2 patients got healed of bed sores! I had minor burn from cooking last month. At first I was hesitant to put dressing because I know it would hurt when I remove it, but when my sister gave me this and she said how great this is, I complied. I was quite surprised that it didn't hurt a bit once removed and also there were no fiber left in my wound, something you can't see with other wound dressing. Fibracol Plus Collagen Review - Why is Johnson & Johnson Fibracol plus collagen ideal for wound dressing? Fibracol Plus Collagen is a sanitized Wound Dressing that can be cut to suit surface and flesh wounds. I always have the problem of wounds getting dried and cracked. Johnson & Johnson have combined the wound dressing with collagen and exudate to keep the wound moist and speed up the healing process. On the plus side, it doesn’t leave pain and marks. I am very happy that it comes in a package of 12 or 72 and highly recommended for by medical practitioners. I fell off my bike and got wound on my knee and elbow. I have quite sensitive skin so I was worried about having scars on the spot but with this, the injured parts were completely healed and didn’t leave me a scar since it keeps moist environment. Not only that but it’s really convenient because it can be cut into any size so I could make small pieces to attach them both to my knee and elbow.